Sonic in Your Face! 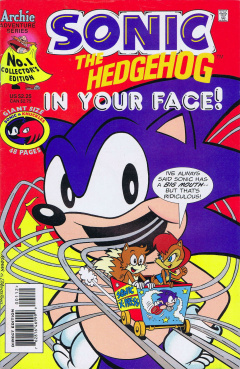 is the first speciality 40 page issue of the Sonic the Hedgehog comic series. It was released in January 1995 and takes place after issue 18. This comic features three stories: The Quest, The Mirror Zone, and Tails' Tallest Tale. It also features two pin-up posters. Sally Acorn and Sonic are practising their combat skills in an exercise room in Knothole Village. Sonic jumps at Sally and nearly hits her head as she seems to be zoned out. He yells at her right before he hits her, causing her to duck instantly. He lands, asking her if she is alright. She takes off her protective gear, telling Sonic that her thoughts have been elsewhere due to the arrival of the mysterious orb and the death of Julayla. At that moment, Rosie arrives and tells Sally that matters relating to Julayla must be taken care of. She leaves Sonic and walks with Rosie to another room. She tells Sally that Julayla was explicit about the division of her estate upon her death, and reveals a room full of Julayla's belongings, all of which have been left to Sally. She enters the room and starts rummaging through the belongings. She finds Julayla's hope chest, which she was meant to receive on her wedding day. In another box, she finds a blue vest, which interests her. She looks in the box again and finds an old photo of her and Elias Acorn. She continues on and finds a map with instructions stating the map be followed upon Julayla's death. Realizing this is all too much, she decides to call it a night and continue on the next day. That night, while asleep, the mysterious orb, which is still in Rotor's workshop, starts glowing more than usual. Sally, sensing something, wakes up and walks slowly to the workshop. She arrives to see the orb floating in mid-air, glowing madly. It starts speaking, and greets Sally. The orb turns into a flip-top hand-held computer device that introduces itself as NICOLE. Sally walks over and asks what it is. Although it introduces itself as a friend, only Sally can make that decision. She picks it up, thinking that it reminds her of someone who encouraged her to make her own decisions. NICOLE thanks her just as the other Freedom Fighters arrive, asking Sally if everything is alright. Sonic asks who Sally was talking to, pointing at NICOLE. She hands it over to Sonic, asking what he thinks. He shakes it a bit, which prompts it to give Sonic a large electric shock. Sally scolds NICOLE, but NICOLE retorts, scolding Sonic for shaking it. Thinking it's more trouble than worth, Sonic tells Sally to get rid of it. Sally, on the other hand, doesn't want to, considering it a friend. At sunset the following day, Sally adorns Julayla's blue vest and prepares to go on a quest. From her final testament, the only way for Sally to achieve oneness of her soul is locked inside the Forbidden Zone. As it is a personal, and possibly dangerous, mission, she decides to go it alone, except with NICOLE. She tucks it away, along with a slingshot, and heads out the door. Just as she walks out, she's stopped by the other Freedom Fighters, standing with the Tornado, offering to help. She tries to dissuade the group from joining her, but the others are quite adamant about going, as danger is their business and that she'll always need friends. She gives up and boards the Tornado, telling them they can come. Rotor takes the helm and flies the Tornado near the Forbidden Zone. He tells Sally that they are at the drop-point, and her, along with Sonic, Bunnie Rabbot, Tails and Antoine, jump off the plane. They quickly land and cover their chutes. Nearby, a large security wall with Swatbots protect the entrance to the Forbidden Zone. One Swatbot takes note of Sally and Sonic, hiding behind rocks, and lets out an intruder alert. Before it can fire on them, Sally takes her slingshot and blinds the bot with a paintball. They begin their attack on the post, Sally firing paintballs, and Sonic running wildly to confuse them. He cuts into a group of them, giving the Freedom Fighters a chance to pass the security wall. As they go through, one of the Swatbots tell the others to halt their pursuit, as they have entered the point of no return into the Forbidden Zone. Entering the Forbidden Zone, they come upon another rock wall. They grapple up and use ropes to enter past the wall. Sally, using the map she got from Julayla's estate, points in the direction they must go, but notes there are obstacles on the wall to their objective. They walk into a rock cavern and wonder what obstacles they could meet. Almost right away, they come upon a large robotic cyclops blocking their path. Sonic decides to take on the cyclops himself and uses his super-speed to beat its attacks. He goes in to attack it, but is deflected by the metal on its stomach. The Freedom Fighters are clueless as to how to get past this beast, but Sally has an idea up her sleeve. "Whosoever pulls the sword from this stone shall best the BEAST"
With Sonic trying to avoid the griffin's fire attacks, Tails decides to go ahead and try to remove the sword. He grabs the hilt of the sword and tries to pull. The sword refuses to budge, but he doesn't give up. He keeps trying and trying, until the sword pops right out. Back in the battle, the griffin prepares to swoop down at Sonic, but is slain by the sword held by Tails. It crashes into the ground. Sonic dodges the downed griffin and goes over to Sally, asking what happened. NICOLE clears everything up, by saying that the sword Tails received stopped the griffin. Sally complements Tails, but asks him to look before he leaps next time. They continue on. Sally takes a look at her map, stating that they have almost arrived at their destination. They turn another corner, and have to face one more obstacle: a two-headed dragon, blocking two doors. Sonic is surprised at the size of the dragon, realizing they may have to fight this large beast. Sally, however, decides to think the situation through before fighting. She calls up NICOLE and asks about the dragon. It introduces the creature as the Polysaurus Rex, one head speaks the truth while the other speaks lies. It guards two doors, one of which leads to their destination, the other leads to their doom. Warning her to choose her words wisely, she realizes she has to ask the dragon a question. She only has one opportunity though, and can only ask one of the heads. She asks the head on the left what the other head would claim would lead to the end of their quest. The two heads look at each other and laugh. The left head complements Sally on her wisdom and advises her to take the left door. Sonic prepares to go for the door, but Sally stops him, telling him to use the right door. To clear his confusion, Sally tells him that if that was the head that told the truth, it would have told her the other head would've lied. The lying head would then state that they should take the left door. Hence, they proceed forth and try the right door. ...but 20 years later, she does. The words on the scroll have given her a feeling of oneness with her soul as she leads a free Mobius. With her faith, she was able to lead the others in their defeat of Robotnik, married Sonic, started a new kingdom, and a family. In her castle, she stands with Sonic, Antoine, Tails, a de-roboticized Bunnie, and Rotor working on a mechanical object. Her kids, one that looks like Sonic and the other like herself, run in at Sonic-speed, but are stopped by their grandfather: Elias Acorn, who they were able to bring back. Rotor finishes on his mechanical trinket, revealing NICOLE. The future Sally welcomes back her old friend, who was destroyed in their final battle against Robotnik. With time-travelling technology, Sally realizes where NICOLE came from, and bids her friend goodbye as they send it back into the past to help Sally. Sonic and Tails are out to stop a Swatbot who is delivering a top-secret message to Robotnik. They chase it up to a barrier, which leads to the mirror zone, where everything is flipped backwards (including the comic text). They hop into the zone, but don't have to travel far to find the Swatbot in question. They launch at it and destroy it, with Tails taking a monitor with the message that the Swatbot was holding. Mirror, mirror, on the wall, who's the most evil tyrant of them all? ...and who's the dumbest hedgehog of them all? Fast as fast can be. You'll never defeat me! Here's looking at you, Sonic! Tails is hopping through the Great Forest, on his way to be a special guest at the Sonic Fan Club's Big Convention. However, he's running late as he can't fly through the thick part of the Great Forest. While in the middle of his thoughts, a frog jumps in front of him, scaring and causing him to jump back into a pond. He gets up and eventually makes it to the Sonic-con, albeit late. He enters to a large convention hall full of Mobians who are fans of Sonic. Sheldon (a turtle), the president of the convention, greets Tails and introduces him to their resident Sonic expert, Posey. Posey, a possum, is delighted to meet Sonic's apprentice, although Tails considers himself a sidekick. She takes Tails to the podium where he is to do his speech. Unfortunately, he has no cue-cards and has totally forgot what he was going to say out of nervousness. He arrives at the podium and nervously sets up the microphone. He tries to think how to start the speech, and begins to mention about his little trip-up on the way to the convention, but then realizes he could just fake something. He continues his story, but tells a lie, stating that he was flying the Tornado when he came upon Robotnik's deadly Toadzilla, a large frog-like robot. Jumping out of the plane, he fought the bot by hand, causing the two to plummet off a cliff into a river. He finishes up his story, but realizes the group is gone, looking out a window instead. He walks over to the group, and witnesses as Robotnik has arrived in a long-legged robot. Unfortunately, these Mobians think they can't stand a chance against Robotnik. Posey, believing Tails' story, pushes him outside to fight Robotnik like he did in his fake story. He flies up to Robotnik and tells him to scram, thinking he's doing a good job after Robotnik sarcastically tells him he fears him. While caught out of attention with his thoughts, Robotnik slaps Tails away with the arms of his robot. The other Mobians help him as Posey takes the job on herself to stop Robotnik. Using the robot, Robotnik prepares to step on Posey, giving Tails a boost of confidence to stop him. He develops an idea and flies back infront of Robotnik. He focuses his attention on keeping his tails still, to let his body rotate instead. With enough concentration, he is able to do it, causing his body to rotate at a very fast motion. Robotnik becomes extremely disoriented from the rotating motion and loses control of his robot, causing it to fall backwards. Defeated, Robotnik flies away in his eggmobile. With Robotnik defeated, a dizzy Tails returns to the ground and is congratulated by the other Sonic fans. Posey even gives him a kiss for a job well done. They head back to the convention, where Tails decides to tell her the truth of his tale. The origins of Nicole and Sally's vest are shown. This is the first time a future timeline is shown. Future timeline stories will be touched upon in numerous issues, along with in Sonic Universe. The first pin-up features an image of Sonic and Tails in Green Hill Zone, with the Death Egg in the background. Tails' slaying of the griffin is not shown to the reader.